Peter Dawson is to retire as chief executive of the R&A in September 2015. 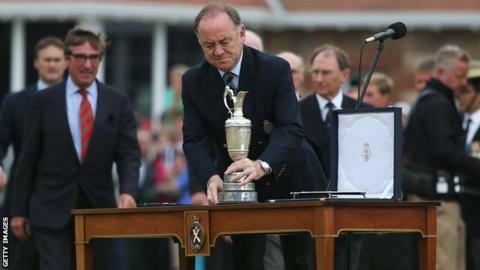 He will also step down as secretary of the Royal and Ancient Golf Club of St Andrews, it was announced on Tuesday. Dawson succeeded Sir Michael Bonallack as chief executive of golf's governing body in 1999. The organisation will advertise for a replacement. He presided over the creation of a separate group of companies to run the Open Championship and its governance responsibilities in 2004. That step, which came as the club celebrated its 250th anniversary, allowed it to concentrate on catering for its 2,000-plus members. In a statement, the R&A paid tribute to Dawson, crediting him with ensuring the Open's "continuing commercial success", and allowing the organisation to "invest substantially in supporting the development of golf around the world". The R&A is to advertise the chief executive's post this weekend and said that "an appointment is expected to be made in sufficient time to allow for an appropriate handover period in 2015". Dawson will continue as president of the International Golf Federation, the body recognised by the International Olympic Committee as the world governing body for golf. The IGF has extended his term of office until 2016, when the sport will make a return to the Olympic Games in Rio de Janeiro.